As we dedicated ourselves to this question, we began to coach singles and couples in applying our discoveries to transform their own lives. We’re thrilled by the rapid shifts we’re seeing in the people we inspire and coach. People say they’re feeling more loving and accepting toward themselves, more connected to those around them, and more confident about the possibility of creating their own soulmate experience. And many of them are doing just that. Many of our ideas are unconventional. They also work. People often tell us we’re the happiest couple they’ve ever met. They see how connected we are, and they want to know our secrets. These are our “secrets”—all the ideas, tools, and techniques we use to continually create a magical life together. We use these ideas to allow the things that come up in every relationship—from fears and expectations to jealousy and resentment—to enhance our experience rather than detract from it. We use these ideas to lovingly guide each other into opening up to everything we have the potential to be. We use these ideas to keep the love, passion, and fun alive, every single day. We believe that as you incorporate even just a few of these ideas into your own life, all your relationships will begin to feel more loving, more connected, and more rewarding. You’ll find yourself feeling confident, excited, and inspired. And you will realize that you have everything it takes to create and sustain your own soulmate experience. We are available for interviews and seminars. 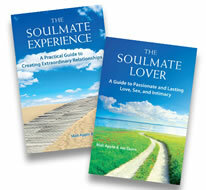 Contact us at MaliAndJoe@TheSoulmateExperience.com.